There are many products on the market that can aid people with limitations drive their vehicles and have some independence. The aids included in this section are spinner knobs, left foot gas pedals, pedal extensions gas and brake controls. Depending on your jurisdiction you may be required to take a road test, have a special license, get a prescription or have special training before being allowed to use these adaptations legally. To find out what is required in your area check with your Provincial Department or Ministry of Transportation. Spinner knobs are simply rotating knobs that clamp onto the vehicle steering wheel and give the driver more control over steering than they would normally have when using only one hand. 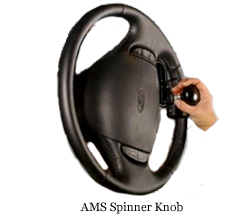 Spinner knobs are intended for use by those who only have the use of only one hand for steering because of physical limitations, or the use of hand controls, and in most areas are not supposed to be used by people who don't require them. The spinner "knobs" are available in different sizes and shapes such as round knobs, flat or oval disks, posts and other shaped grips to provide the most comfortable and functional grasp possible. For those who don't aren't able to use their right foot to operate the gas pedal a few companies have developed left foot gas pedals. 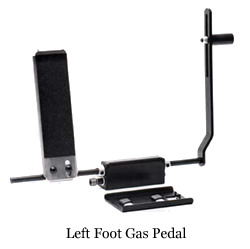 These pedals are mounted to the left side of the brake pedal and have a linkage that connects them to the vehicle's existing gas pedal. Because of their location left foot gas pedals can not be used in vehicles that have a clutch. Having a left foot gas pedal in a vehicle does not impede those who are able to operate the gas pedal with their right foot to drive as they normally would. Pedal extenders are gas and brake pedals that are clamped to the vehicle's existing pedals and extend them towards the driver to allow those who are not able to reach the pedals properly to drive. Because most vehicles have air bags installed in the steering wheel there is a danger of injury to the driver by the air bag if it deploys and the driver is less than 12" away. The installation of pedal extenders can help prevent air bag injuries. 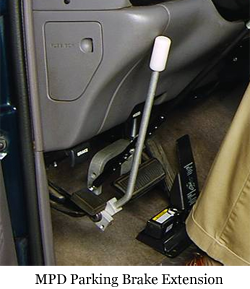 Pedal extenders will make it difficult for those who don't need them to drive the vehicle. Some are designed to be quickly installed and removed but they still are a little difficult to reach and disconnect. Hand controls enable people who aren't able to use their legs well enough to drive to control the gas and brake pedals with one of their hands. When driving the user will usually push the hand control lever to operate the gas pedal and pull to operate the brake pedal. Installing hand controls does not normally require any major changes to the vehicle shouldn't impede the ability to drive of those who don't need them. They usually consist of linkages that connect the gas and brake pedals to a control bar that the user uses with their hand. There is a bit of a learning curve required to drive well using hand controls and most transportation ministries require some training and possibly a road test before allowing people to drive legally using them. 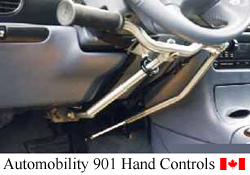 Click here for more information on hand controls. 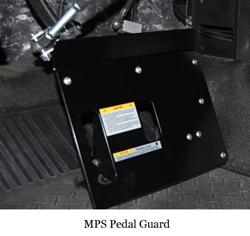 Pedal guards are devices that prevent the driver's feet from contacting either the brake pedal or gas pedal. They are specifically intended for drivers who use hand controls to drive and accidental contact of their feet with the pedals may cause the hand controls not to work correctly. 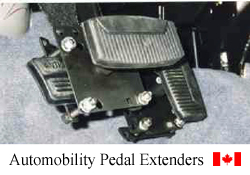 Most models of pedal guards offer either a quick release mechanism or flip out of the way so drivers who don't use the hand controls can drive the vehicle. For people who have difficulty operating a vehicle's signal switch there are a variety of turn signal extensions available. 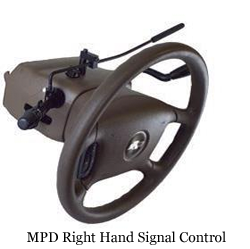 They are available in various designs for use with the right hand and also available as a drop lever so that people using hand controls can reach them without removing their hands from the controls. As with most other adaptive driving equipment, these extensions do not impede others from driving the vehicle. As the name implies, parking brake extensions are extension handles that make the engaging and disengaging the parking brake easier. They are available for both foot activated parking brakes and console mounted parking brakes. The console model extensions are designed so that the user can depress the brake release button and release the parking brake with one movement. Gear shifter extensions are available in a variety of designs to work with the various types of gear shifters found in today's vehicles. 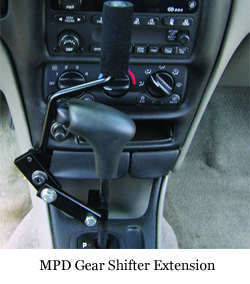 These shift extensions are for use with automatic transmission vehicles. Among the shifters that can be adapted with an extension are conventional column shifters (can be adapted for either left or right hand use), "T" shifters, dash mounted shifts and gated shifters (both horizontal and vertical).